Have you ever picked a book up, read the first page and knew you were going to love it? 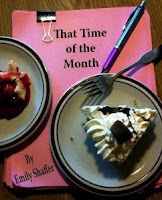 That's how I felt about That Time of the Month by Emily Shaffer. This is one of the funniest books I have read in a while. The book begins with Eleanor "Ellie" Bennett losing her job as a temp lawyer. Not the worst thing since she hates her job, but a near disaster, because she has no money and no real job prospects. In a moment of weakness she formulates a plan to write a novel in a month. She chooses a quaint little coffee shop as her quiet writing location, but it's anything but quiet. Ellie has multiple debacles throughout the book, including a broken foot and a mystery coffee shop regular that may or may not be the man of her dreams. Ellie's disasters are not only funny, but totally relatable. If you are at all clumsy or have ever felt like you've made the wrong choice a few too many times, then you'll emphasize with Ellie. Her neurotic, list-making tendencies are by far some of the funniest parts of the book. A personal favorite of mine is her New Year's resolution list. "Resolution #152: Try to understand America's fascination with Nickelback." Emily Shaffer's comedic timing is perfect and the jokes just keep on coming. That Time of the Month was well written, but could still benefit from the help of a good editor. Overall, I recommend picking up That Time of the Month, you won't regret it. And the best part— it's cheap, especially if you chose the kindle edition like I did! Six Christmases and it's finally over! Dear Snow, I hate you! It's gonna cost how much to print it? Who needs a publicist when I have Tracy?